One of the best opportunities for PA school candidates to distinguish themselves within the PA school application process is through the personal statement. However, writing the PA school essay is also the most intimidating part of applying to PA school for most prospective students. Crafting an essay that is impactful while maintaining the authenticity of the author's story is no easy feat. And it's made tougher by the fact that most applicants have not written something similar at any point in the past. So, when you're looking to start your PA school essay, you'll likely check out a few examples from other applicants, read some tips on what to include, and begin pondering what you'd like to cover in your personal statement. Even though most applicants are first-timers with a variety of experiences, many prospective PA students fall into similar patterns when working to create their PA school essay. Therefore, before you get too deep into your mulling over what deserves space in your personal statement, knowing some of the common missteps of essay writers can help you keep your planning on track from the beginning. 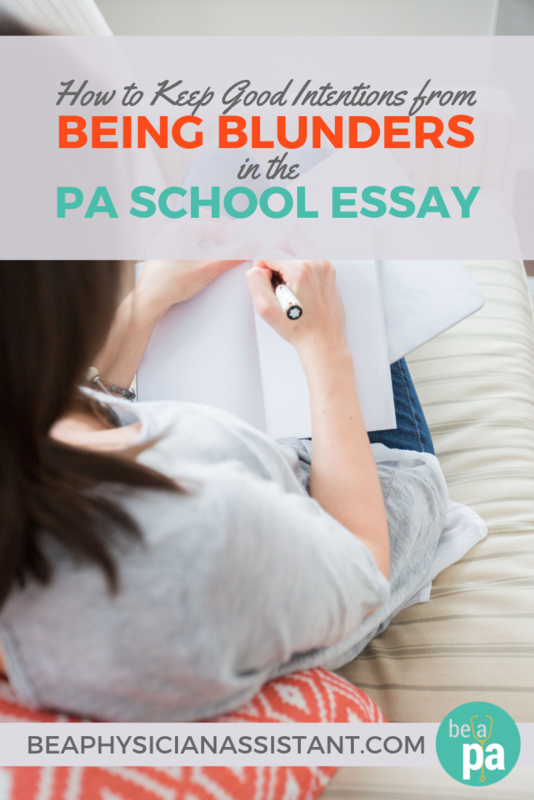 Here's how to keep good intentions from being poorly executed in your PA school essay. While your motives for wanting to become a PA may be good, there are a finite number of reasons that anyone might list to explain their choice — the ability to concentrate on patient care, the clinically focused training, the opportunity to act as a decision maker, the chance to work collaboratively, the possibility of swapping specialties, the relatively short training time, along with maybe another two or three. There are plenty of great reasons for wanting to become a PA, but there are not endless ones. And because the list of what makes PAs unique is not unlimited, when you try to explain your reasons for wanting to become one in your personal statement, those same ideas will be shared by thousands of other applicants. The way that you distinguish yourself and bring life to your essay isn't through your reasons for becoming a PA but in explaining these reasons through your experiences. Even if plenty of other people have held the same patient care position or had similar shadowing opportunities as you, your experiences uniquely yours. Some experiences, though they may feel exclusive to you, pop up again and again in the essays of other applicants. The most common one of these is having no idea that PAs existed until some pivotal point. This is, of course, true for everyone. No one is born with innate knowledge of the PA career. However, the way you describe your discovery matters. Your explanation of how you learn of the PA profession should not rival Alexander Fleming's discovery of penicillin. You shouldn't watch a white-coated lady rush into a room, take charge, save the patient and a bystander, while she's at it, then do a slow pan to her name tag where you find out that she's, gasp, not a doctor, but a something called a physician assistant. Even if it feels like an original experience to you, plenty of other applicants are depicting similar scenes in their essays. I know because each application cycle, I review hundreds of essays describing these same kinds of experiences. The PA programs you're applying to have read thousands of them. And they'll continue to read thousands more in every application cycle. Knowing this shouldn't diminish your experience. Your initial encounter with PAs can still be just as big of an influence on you as it's always been. But in your essay, sharing how you learned about the PA profession is best done through a measured tone. Phrases like "I had never heard of a physician assistant before" or "I had no idea that PAs existed" aren't needed. Instead, talk about how you learned of the profession, free of drama, and then use that encounter to move the story along to your more significant experiences. While the purpose of the personal statement is to describe your motivation to become a physician assistant, ideally, your essay will also do double duty to prove to your chosen programs that you're a good match for them. To accomplish this second goal, applicants might peruse the mission statements of their target programs for inspiration. Some take this a step further and include particular words or phrases from the mission statements of their top choice programs into their essays, hoping to show a program how well they align with the school. This approach, however, usually doesn't accomplish what it sets out to. First, the language used in mission statements is different than how most people write. Repurposed words or phrases from the mission statement in your essay usually sound awkward. Saying that you will be a "caring, competent primary care physician assistant who practices evidence-based medicine and is devoted to the positive transformation of the health care system" will likely come across as a bit stiff. Likewise, when 90% of the usage of a word in the English language is relegated to mission statements, like with "humanistic," using it in your essay sounds weird. Second, and more importantly, PA school faculty members probably don't know the exact wording of the program's mission statement unless they, like you, consult it immediately before diving into your essay. Mission statements are often vague and quite similar from program to program. As a whole, they aren't a great source for understanding the values of a program. Faculty members are pretty great at using your application and essay to recognize if you seem to have values that align with their program. If you want to use a mission statement for inspiration, focus on the spirit of it rather than the wording. To prove to PA schools that you're ready to become a PA, part of your job in both your PA school application and your essay is to demonstrate that you understand the role of a PA. Many applicants come quite close to accomplishing this in their essays, but fall a bit short by focusing on what I call "PA facts." "PA facts" are when an essay writer gives accurate information about what a PA does but fails to tell a reader why that's important to them. Often, these true-but-boring points seem removed from the experience being discussed by an applicant. "As PAs are fulfilling the roles of doctors in primary care, urgent care, and the ER, some of their most important responsibilities are providing patient education on healthy lifestyle habits and overall self-care." "These individuals may have less formal medical training than their physician colleagues, but it does not negatively impact their ability to practice medicine." "Physician assistants expertly utilize their intuition, knowledge, experience, and resources to effectively diagnose and treat a variety of ailments, including conditions they have not previously seen." If you want to avoid sharing PA facts of your own, a few simple moves can help. Embed PA actions within your experience. You can describe what PAs do through the perspective of what you observed while shadowing or working alongside a PA in your patient care role. When you frame what a PA does through your experience, you'll do a better job of connecting it to the rest of your story. Include the impact on you. "I appreciated seeing..." or "I was impressed by..." can go a long way in counteracting the disconnection between your story and PA facts. Instead of only saying what a PA did, remember to mention that it was valuable to you and why. Keep an eye out for lists. Often, PA facts are grouped in a single sentence, as demonstrated in a couple of the examples above. Whenever the ideas are not tied to the writer's own experience, they're difficult to separate and will show up as a list. While you want to show a prospective program that you understand the role of a PA, don't forget the main point of the essay–to explain your motivation for becoming a PA–in the process. Show what you know about being a PA through your experiences and remember to include why those PA abilities are important to you. Creating a quality personal essay for your PA school application can seem, at least a first, a bit intimidating. But, understanding some of the most widespread pitfalls of essay writers is a significant first step. Having a few guardrails in place to protect against these common essay blunders can keep you from straying off course and, instead, allow your good intentions to translate into excellent execution. Older PostAre You Dedicated Enough to Be a PA? I've been a practicing PA for over 12 years and I help future PAs, like you, get ready for PA school. Copyright ©2019 Be a Physician Assistant Consultants, All rights reserved.